Of all the building supplies acquired at the Eco Relics architectural salvage company, vintage and antique doors are among the most sought-after. Doors are often taken for granted, but they preform many silent (or squeaky) services beyond their aesthetic appeal. When open, doors admit people, animals, ventilation, and light. When closed, doors prevent the spread of noise or fire, enclose air drafts to allow for heating and cooling, and can be locked to restrict access. Doors are rich with symbolic meaning, often finding reference in metaphor, allegory, literature, and the arts. 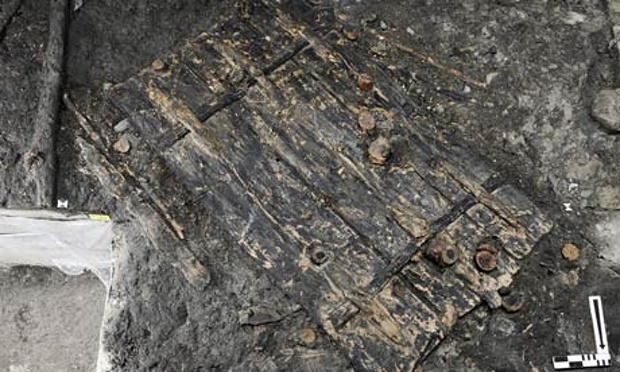 This 5,000-year-old solid poplar neolithic door is the oldest found in Europe. The earliest record of doors is in ancient Egypt, where the dry climate allowed for the construction of doors as single slabs, because they would not warp. In other parts of the world, doors developed a frame of stiles and rails to hold panels that fit into their grooves. Ancient doors swung on pivots above and below the hanging stile that fit into sockets in the lintel and sill, the sill socket usually made of hard stone. The pivots were often banded in bronze for durability. 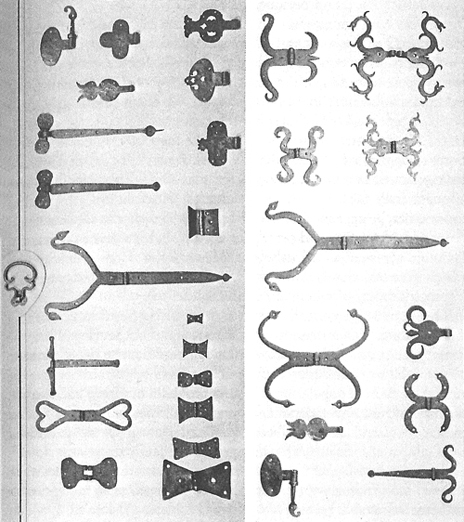 Colonial hinges from the 17th and 18th centuries. The transition to the modern hinge is not well documented. Evidence of hinges dates back to the bronze age, but early hinges would have been very expensive to produce. Ancient metal hinges served as examples of the wealth and power of the owner, usually seen only on city or palace gates. Most people probably did not have access to hinges until metal-working advances allowed local blacksmiths to construct them from wrought iron. Military applications for the hinge also followed. Antique hinged weapons, like the Persian trebuchet and the crossbow, provided strategic advantages to early adopters. Antique doors are excellent repurposing stock, easily converting into tables, headboards, bookshelves, chairs, benches, desks, room screens, and more. The internet is flooded with DIY ideas for doors. Panel doors are reduced easily into modular building units, making them an ideal choice for a variety of projects. The flatness of a slab door works great as a work surface or table top. The light weight screen door provides a sturdy frame for projects that hang, like pot racks. Adding mirrors, corbels, molding, and other architectural elements to your vintage door project will enhance its natural beauty. Vintage and antique doors are plentiful in the Eco Relics warehouse at 106 Stockton Street in Jacksonville, Florida. Stop by and check out our selection of panel doors, screen doors, french doors, dutch doors, slab doors, sliding glass doors, hollow and solid core doors, door with glass, front doors, metal doors, arched doors, and just about any other kind of door you can think of. Our friendly and knowledgeable staff are eager to help customers turn architectural salvage and building supplies into the unique antique piece they are looking for.